Come down and try our new Paddlesport evenings, ideal for getting you out on the water! These informal nights can be used to improve your fitness, practise skills and have fun with friends and family. The evenings are from 6.00pm – 8.30pm on Tuesday between 7th May and 27th August only and Thursday between 2nd May and 29th August only. For this great price you can take out the following craft for the evening (terms and conditions apply): Stand Up Paddle Board, Kata Kanu, Row Boat, Kayak or Canoe. SUPing, Kata Kanuing and Row Boats all require participants to be able to swim 10 metres. 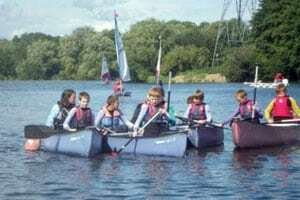 Kayaking and Canoeing both require participants to be able to swim 10 metres and to hold the British Canoeing 1 Star Award/Discover Award or equivalent (evidence is required when registering). Please note that registration is required for all users and the 2019 Paddlesport Registration form must be completed and brought with you on your first session. Alternatively register on the night. Forms completed for under 14’s must be signed by a parent / guardian. Once completed, a user card will be issued and must be presented on every evening. If you do not yet have your BC 1 Star Award/BC Discover Award but would like to take part in Paddlesport Evenings throughout the year then this is the perfect opportunity to gain the qualification needed before it all starts!